Downey Daily Photos: What's stopping you? Along the river walk, you see all kinds of fences to discourage casual riverbed traffic from wandering through the bordering neighborhoods. In this area on Downey's island, various kinds of cactus grow up, through, and around the fence. 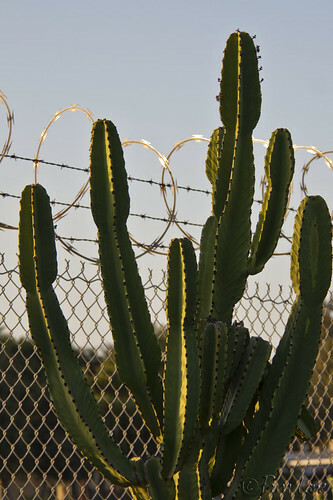 What do you think is the greater disincentive — the razor wire at the top of the fence or the cactus needles? For more pictures taken around the island, click here. Aaaah, with my vivid imagination, I see what happens if I try to climb over. wrong idea. Very sharp photo. What do they feed these flowers?